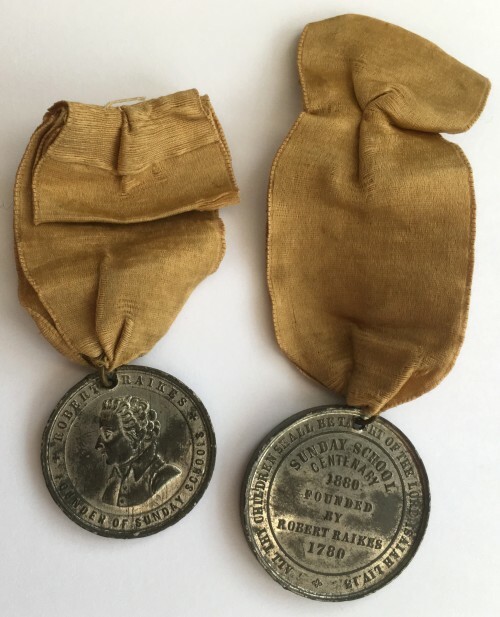 These two medals were donated to Quorn Local History Group by the Footitt family from Quorn. They are slightly different to each other, but both commemorate the centenary in 1880 of the Sunday School movement. Robert Raikes (1736 – 1811) was an English philanthropist and Anglican layman. Although there were a few Sunday schools before 1780, Robert Raikes was responsible for pioneering the widespread Sunday School movement. This was fifty years before the first state schooling in 1831. In 1880 thousands of the alloy medals were made and given to children attending Sunday School at that time.